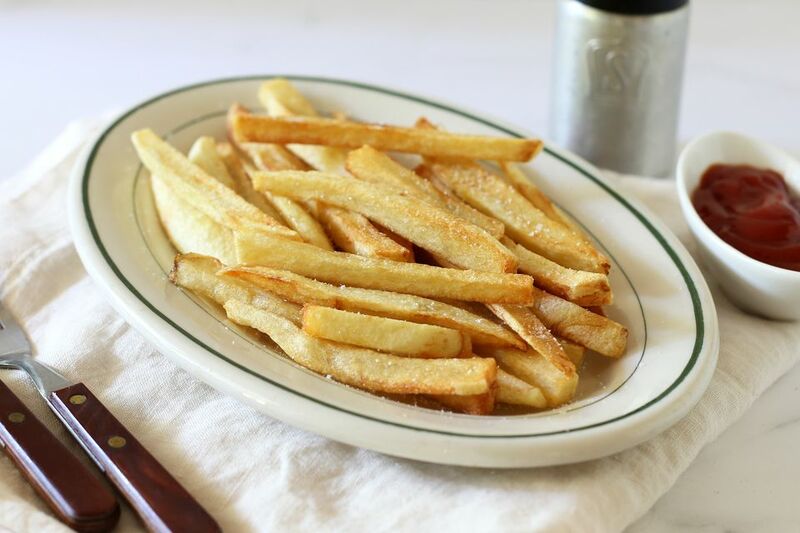 These homemade deep-fried French fries are as crispy and delicious as you would get in the drive-thru, and with none of the mysterious ingredients and enhancements. You can select an oil that suits your taste and diet, and with just potatoes and salt as the only other ingredients, you know what you are eating. Peel one potato and slice it in half lengthwise. Place a potato half on the cutting board, cut-side down, and cut it into slices about 1/4-inch thick or slightly thicker. Stack several slices on the cutting board and cut into 1/4-inch thick fries. Soak the cut potatoes in ice water for 1 hour at room temperature. Drain the potatoes thoroughly and then pat dry with paper towels. Add about 2 to 3 inches of oil to a heavy pot or Dutch oven and attach a deep-fry thermometer. Alternatively, use an electric deep fryer. Heat the oil to 370 F.
Heat the oven to 200 F and place a rack in a baking pan (to keep batches of fries warm). Carefully lower some fries—about two handfuls—into the hot oil using a slotted metal utensil or deep-fry basket. Fry for 3 to 4 minutes, or until tender and golden brown. Turn the fries out onto paper towels to drain. Transfer to the rack in the baking pan and place it in the oven to keep warm while making subsequent batches. When finished frying, sprinkle the fries with salt. Peanut oil is a good choice for frying—its mild flavor and high smoking point are ideal for French fries and other deep-fried foods. However, you can use another neutral-flavor oil such as vegetable, canola, corn, or high-heat safflower. A secret to crispy fries is first soaking the cut potatoes in water—this eliminates the sugars, allowing the outside to develop its signature crunch, and removes the starch, so the potato pieces don't stick to each other. Make the fries in an electric deep fryer with a basket or use a heavy-bottomed pot or Dutch oven and mesh strainer—just make sure to attach a deep-fry thermometer to the pot to keep track of the oil's temperature. Maintaining the correct temperature is crucial to achieving the perfect French fry. Many people swear by the two-step "double-fry" method. To double-fry, cook the soaked and dried potato strips in 325 F oil for about 5 to 6 minutes. Remove the partially cooked potato strips to a rack. When all of the potatoes are partially cooked, increase the oil temperature to 350 F. Cook the potatoes again for about 2 minutes, or until they are tender and golden brown. Drain on paper towels and then transfer to the baking pan to keep warm, as desired. Any favorite spice blend can be used to make seasoned fries. Try a combination of 2 teaspoons of smoked paprika with 1 teaspoon of salt, 1/2 teaspoon of black pepper, 1/2 teaspoon of garlic powder, and a dash of ground cumin. Sprinkle the French fries with the seasoning blend after draining.